Do you ever wonder how Newt pulls it off? No, we don't mean all the magical beast gathering. Yeah, it's pretty amazing the way he gets the shy moon calves to trust him. He's cautious but confident in his approach to the toxic breathed nundu. And yeah, we definitely wouldn't want to touch the rat like murtlap. But what we really want to know? How does he continuously look so dapper on his whirl wind journey? We have a hard time when we're simply looking for our keys. Really, you should see us! Our hair is messed up, our faces are red. New Scamander loses a bunch of magical creatures in the midst of New York, he might have been stressed but he's always looking suave. We don't suggest you start traveling the world looking for magical creatures in precarious areas. Or transporting any animal, magical or otherwise, by suitcase. 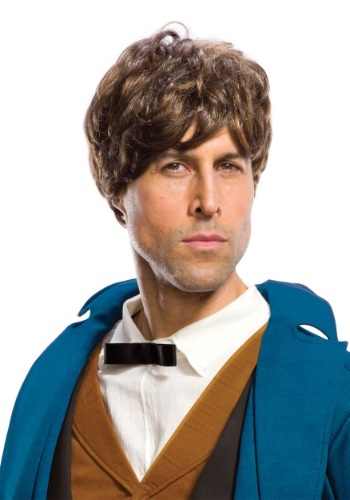 We do recommend popping on this suave Newt Scamander wig to finish off your costume. After all, when you're convincing magical animals to trust you, it's the little details that matter.